In 1963, Goldsmith said, "This year the word came to me to take our students from metaphysics to mysticism ... and this mission was immediately undertaken." 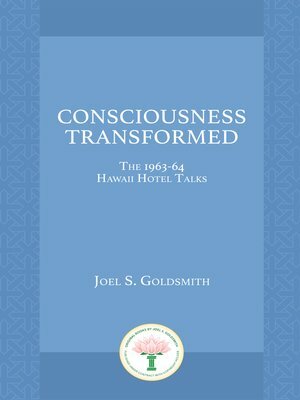 To fulfill the mission, Goldsmith gave 62 "Hotel Talks" in Hawaii during 1963 and 1964, which are collected in Consciousness Transformed. This is a 600-page book that contains the deepest of Joel's teachings. The talks were not tape recorded and are presented in this volume from transcripts. They are considered by many to express mysticism at its highest level. At one point Goldsmith himself said, "During the last two to three weeks... it became clear that we are entering the consciousness that does not need words or thoughts. We can sit down to meditate and realize: The Kingdom of God is 'closer than breathing, nearer than hands and feet.'" Consciousness Transformed is the third book in the trilogy of lecture series that includes Rising in Consciousness, Consciousness in Transition, and Consciousness Transformed. Rising in Consciousness and Consciousness in Transition illuminate Joel's early class work, while Consciousness Transformed represents the crown on his many years of worldwide teaching work. Together the trilogy presents a holistic overview of a living message by a twentieth century spiritual master.